a hazy conception of the Absolute Truth. A frequent criticism of the Krsna consciousness philosophical tradition is that it places too much emphasis on authority. This is not surprising, seeing as how philosophy in the modern world is based on a revolt against authority. And yet we gain a considerable amount of our worldly knowledge from authorities—the media, schools, libraries, doctors, lawyers, and other experts. Devotees of Krsna consider this inconsistency between philosophical ideal and practical experience absurd. If authority is a valued source of our worldly knowledge, then how much more essential it must be in matters of a supra-sensory nature. From the Vedas we learn that without authority there is no real possibility of our penetrating the maze of relative truths in this world and reaching the Absolute Truth in the transcendental world. And it is precisely this Absolute Truth that we desire so much in our quest for certainty. In support of the above conclusions, the Vedas list four characteristic defects that vitiate the reliability of all knowledge gained by perception and inference. First, we all make mistakes—”To err is human.” Second, we are all subject to illusion. Third, everyone has limited senses. Finally, everyone has the propensity to cheat. 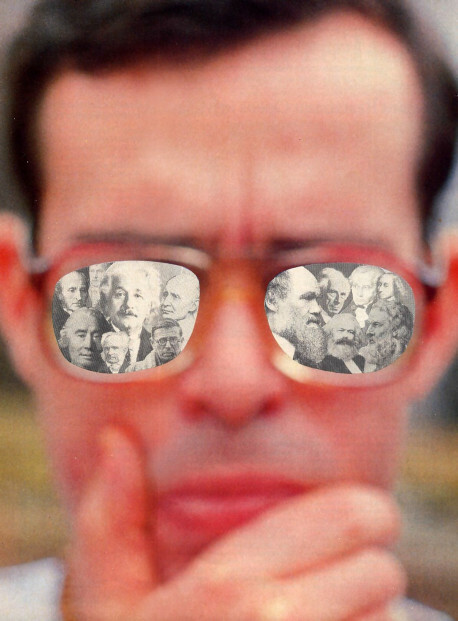 By their very nature, therefore, perception and inference fail to provide us access to the Absolute Truth. If we rely only on them, our quest for certainty is at a formidable impasse. To date in the Western world, a plausible alternative to these has not been devised. The Vedic literature, however, recommends a third source of knowledge: sabda-brahma, hearing from transcendental authority. The Vedas consider sabda-brahma more reliable than perception or inference because it conveys knowledge free of all defects. Please note, however, that the Vedas do not dispense entirely with reason and experience. What they question is the validity of these methods in matters that do not fall within the range of reason and experience. Some of the premises of the Vedas theory of knowledge are as follows: The Absolute Truth is that from which all else emanates; the Absolute Truth is inconceivable; that which is inconceivable can’t be understood by any amount of mental speculation; the Absolute Truth can be understood only if it chooses to reveal itself. Now, keeping in mind that absolute means unlimited, unconditional, complete, perfect, unadulterated, and so on, let us carefully try to understand how one can realize the suprasensory Absolute Truth by the process of sabda-brahma. A great many thinkers have difficulty coping with the Vedas’ assertion that the Absolute Truth is a person. Though they readily agree that absolute means “unlimited,” “complete,” and so on, they somehow retain a limited conception of the Absolute. They speculate that the Absolute must be some sort of all-pervading, infinite, undifferentiated, impersonal, metaphysical substance—a “Oneness” devoid of any personal characteristics. The Vedas, however, explain that the complete Absolute includes both the personal and the impersonal aspects. By way of analogy, consider the sun. The sun is like the personal feature of the Absolute, the sunlight like the impersonal feature. Both exist simultaneously as the energetic source and the energy, but one is localized, the other expansive and all-pervasive. Similarly, the Absolute Person exists simultaneously with the impersonal Absolute. This is necessarily true, although paradoxical, because the source of all emanations must simultaneously contain and reconcile all contradictory notions. The Vedas give numerous details about the name, form, qualities, pastimes, and entourage of the Absolute Person. His name, we are told, is Krsna, the All-Attractive One. His transcendental body is made of eternality, knowledge, and bliss. No one is equal to Krsna or greater than Him. He is the prime cause of all causes. His transcendental abode in the spiritual realm is far, far beyond the material realm. There Krsna always revels in transcendental loving exchanges with His pure devotees. These relationships are untainted by mundane feelings such as envy, hate, anger, fear, illusion, and lust. From time to time, Krsna manifests Himself within the physical world and enacts many wonderful, incomparable pastimes. He also delivers to human society knowledge of the Absolute Truth unavailable from any other source. Krsna does not have a material body. Thus He is never afflicted by any of the four human defects. He is absolute, and His words are absolute. For this reason, His devotees accept the scriptures spoken by Krsna, such as Bhagavad-gita, as authoritative and perfect—absolute knowledge. Hence the basis of scriptural authority for Krsna conscious persons is the Absolute Truth Himself. A: Krsna is the Absolute Truth. A: Because Krsna spoke them. There is another important reason why the fallacy of circular reasoning is not applicable in this case. The Vedic literature gives a scientific methodology whereby one can test its theory of knowledge. 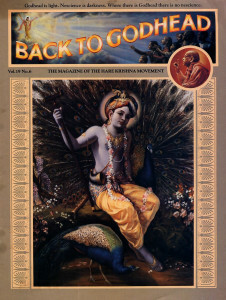 All sages and saintly persons who followed the Vedas’ recommendations to the point of mature transcendental realization—such as Narada Muni, Madhva, Ramanuja, Sri Caitanya, and His Divine Grace A.C. Bhaktivedanta Swami Prabhupada—all confirm that the Vedas emanated from the Absolute Truth, and that the Absolute Truth is Krsna. The knowledge Krsna reveals about Himself in the Vedas is as good as His autobiography. Krsna is the superexcellent authority and the last word on Himself, just as Shakespeare is the last word and authority on himself. Devotees find no contradiction or fallacious reasoning in the theory that transcendental knowledge must come from transcendental authority. Rather, they find it sublime. It is so sublime that even if you withdraw the support of the Vedas, it still stands up to the critical examination of reason. The final point concerning the theory of sabda-brahma is understanding the authority of the guru, the spiritual master. Lord Krsna, besides being the basis of authority for the scriptures, is also the authority for the disciplic succession of gurus. He explains this in the Bhagavad-gita. He is the original guru, having enlightened Lord Brahma with transcendental knowledge. Lord Brahma enlightened Narada Muni, whose disciple was Vyasadeva, and so on down to the present day. Transcendental, indubitable knowledge is first given by Lord Krsna and then transmitted as it is without any adulteration through the disciplic chain. Each guru repeats the message in just the way he heard it from his predecessor guru. Hearing from the lips of a bona fide spiritual master is as good as hearing from Krsna directly. The guru’s teachings and behavior must be in consonance with the Vedic version. The moment a “guru” deviates from this principle, the disciple is no longer obligated to follow him. In the Vedas, Krsna repeatedly exhorts us to seek out a bona fide guru, surrender to him, and please him by submissive inquiry and service. In this way the disciple gradually transcends all material limitations of his senses, mind, and intellect. Then by spiritual cognition, called vaidusa-pratyaksa, he can see Krsna face to face. But he can be successful in this endeavor only if he humbles himself before the authority of scripture and the authorized spiritual master. Actually, accepting authority is the universal principle in learning virtually any subject. Granted, authority has been corrupted and abused in the past—and it certainly will be in the future—but the validity of the principle still stands. Hundreds of years of philosophical speculation have not produced a more feasible method for understanding the Absolute Truth than sabda-brahma. Those who think the process of Krsna consciousness places too much emphasis on authority would benefit immensely by studying the Vedas’ theory of knowledge. They would be pleased to find it “invincible to all skepticism,” although on a personal level they may balk at accepting the discipline. That raises a question of their integrity. As far as the quest for certainty is concerned, there is simply no other way to get around the impasse created by perception and inference. Sabda-brahma has been tried and proven true. It does deliver the indubitable Absolute Truth. It’s a typical “devotee” assertation and over simplification.People just don’t like authority,so they revolt. Does revolt mean, ask questions,use discernment? Of course its all about surrender “Prabhu”. What any rational person would ask or a person who was actually sincere in wanting to assist people in the ultimate goal of life.Is why are people so repulsed by the idea of authority especially in spiritual matters.Its because people are force fed lies on a daily basis from politicians,educators,corporations and so called religious leaders.The institution of iskcon is a perfect example of “authorities” who have lied and misrepresented themselves over and over again until any person in their RIGHT MIND can see they cannot be trusted.So naturally people would rebel at the idea that “the ultimate truth” will come from such pretenders. So who can you trust? No one. Yes. Practically everyone is cheating so we loose trust in authority. But the fact remains that spiritual matters are beyond the ability of our minds to conceive and beyond the ability of our material senses to perceive. So the only way we can get information about spiritual matters is if we can find a bona-fide authority, a bona-fide spiritual master. And they process to receive real knowledge is submission, surrender and service. There is no other way. They key of course is to find the right authority and surrender there. If you foolishly select a person who is not a self-realized soul as your spiritual master and you surrender to such a bogus authority then you get what you deserve. Obviously only a pure devotee of Krishna has the power to impart knowledge about Krishna. So if you are fortunate enough to come in contact with a pure devotee of Krishna and if you are fortunate enough to have the intelligence to realize that you should surrender to him and serve him, then your life will be successful. Otherwise you will be perpetually stuck suffering in the material world birth after birth eternally. The only escape from the material world is by surrendering to the bona-fide spiritual authority. There is no other way. If you do not surrender to a bona fide spiritual master you will simply suffer eternally.